[130 Pages Report] The overall conductive textile market is expected to grow from USD 1.02 billion in 2016 to USD 2.11 billion by 2021, at a CAGR of 15.6% from 2016 to 2021. Conductive fibers and yarns are being adopted across various end users such as military & defense, medical & healthcare, sports & fitness, and consumer electronics, among others. Conductive textile materials are usually made of organic polymers that are perfect insulators. However, due to weak electrical conductivity electrical load is accumulated on the surface of organic polymers. Thus, to prevent the accumulation of electrical load and to enhance the possibility of electrical load transfer and obtain electromagnetic shielding effect, the textile materials are turned into electrically conductor by using different methods. The base year considered for the study is 2015, and the forecast has been provided for the period between 2016 and 2021. Growing awareness about the superior functionality and application of conductive textiles has led to the rising adoption of the textiles and related products across varied end-use industries. Conductive textiles are flexible, durable, light weight, and have high strength. The increasing awareness about the functionalities and benefits regarding of the use of conductive textiles in smart textiles and wearable devices has boosted the demand, globally. During this research study, major players operating in the conductive textile market in various regions have been identified, and their offerings, regional presence, and distribution channels have been analyzed through in-depth discussions. Top-down and bottom-up approaches have been used to determine the overall market size. Sizes of the other individual markets have been estimated using the percentage splits obtained through secondary sources such as Hoovers, Bloomberg BusinessWeek, and Factiva, along with primary respondents. The entire procedure includes the study of the annual and financial reports of the top market players and extensive interviews with industry experts such as CEOs, VPs, directors, and marketing executives for key insights (both qualitative and quantitative) pertaining to the market. The figure below shows the breakdown of the primaries on the basis of the company type, designation, and region considered during the research study. 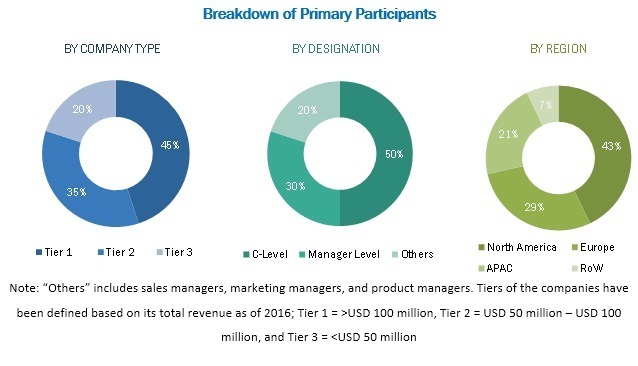 The conductive textile market comprises a network of players involved in the research and product development; raw material supply; component manufacturing; distribution and sale; and post-sales services. Key players considered in the analysis of the conductive textile market are Arakawa Chemicals Ltd. (Japan), Taimide Tech Inc. (Taiwan), Kolon Industries Inc. (South Korea), Saint- Gobain (France), Dupont-Toray Ltd. (Japan), SKC Kolon Inc. (Korea), Kaneka Corporation (Japan), E.I. Dupont De Nemours & Company (U.S.), Shinmax Technology Ltd. (Taiwan), Ube Industries Ltd. (Japan), and FLEXcon Company Inc. (U.S.). In October 2016, Hitek announces the arrival of a solution, which helps in removing the restrictions faced by conductive fabrics. It has been a challenge for the industry to print directly on the fabric surface. The newly developed technique of printing is made using nano-technology which does not affect the conductivity or performance of the fabric. This technique will act accurately even with the stretchable fabric with complex designs. In February 2016, Parker Chomerics company launched Therm-a-gap MCS30, which not only exhibits long-term thermal and physical reliability, but also is resistant to thermal oxidation degradation. Therm-a-gap MCS30 is a series of low weight-loss, fully cured thermal filler pads for low deflection force applications with moderate thermal conductivity and high reliability. . In June 2014, AiQ partnered with Chunghwa Telecom Co., Ltd. (Taiwan) and Broadcom Corporation (U.S.) to provide the smart shirt wearable solutions for vital sign tracking systems. The Intelligent Sensor Shirt is integrated with conductive fibers that sense a wearer's heart rate, skin temperature, and breathing rate, and send it to a device on the sleeve. This gadget pairs with a tablet, phone, or other mobile devices via Bluetooth. In February 2014, The Japanese firm NTT, parent company of DoCoMo, has collaborated with Toray Industries to develop a nanofiber-laced clothing with conductive fibers, and a wristband that monitors vital signs and transmits the information to smartphones and the cloud named Hitoe. The overall conductive textile market is expected to grow from USD 1.02 billion in 2016 to USD 2.11 billion by 2022 at a CAGR of 15.6%. growing advantages of conductive textile, high demand from military & defense sector, and growing smart fabrics market are the key factors driving the growth of the global market. Conductive textiles are fabrics that can conduct electricity. These textiles are used in various industrial applications, mainly to control static and provide shield electromagnetic interference. In recent years, fibrous textile materials containing conductive fillers are being used in various applications, especially in e-textiles and smart textiles. Computing systems, digital components, and electronics can be embedded in e-textiles. Smart textiles are products such as fibers, filaments, yarns, that can be woven, knitted, or non-woven and can interact with users. Military & defense, healthcare, sports & fitness, and consumer electronics are some of the key end users of conductive textiles. The conductive textile market has been segmented, on the basis of type, into woven textile, non-woven textile, and knitted textile. The woven textile segment is expected to grow at the highest CAGR between 2016 and 2021. Woven textile is the largest and the fastest-growing application segment of the global conductive textile market as the conductive textile. The flexibility and durability of the woven textiles makes it a preferred type of textile across various end-use industries. On the basis of end-use industry, the conductive textile market is segmented military & defense, healthcare, sports & fitness, consumer electronics, and others. The sports & fitness segment is expected to grow at the highest CAGR between 2016 and 2021. Increased awareness about the importance of sports & fitness is expected to support the conductive textiles market growth. The conductive textile market in Asia Pacific is expected to grow at the highest CAGR during the forecast period. 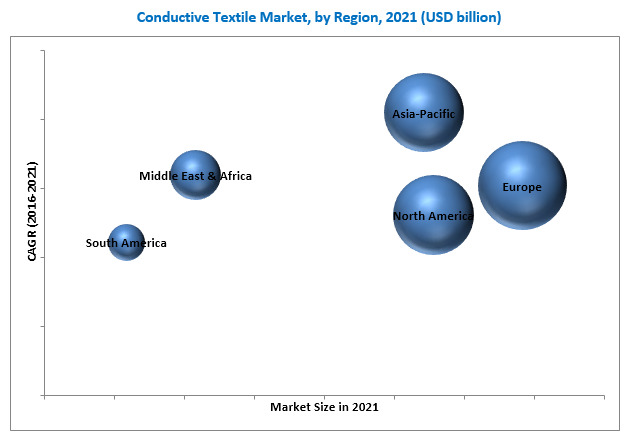 Factors such as the increasing urbanized population in China and India and the increasing awareness about the benefits and functionality of conductive textiles in these countries, are expected to fuel the growth of conductive textiles market in the region. Textiles for in military uniforms are required to provide durability, safety, and protection in hostile environments, damage resistance, and comfort. In addition, sweat management, protection from cold-weather conditions, and the integration of high-tech materials into uniforms is also desirable. Conductive textiles are lightweight, flexible, and provide high strength and superior conductivity and are therefore rapidly adopted across the military & defense segment. In the healthcare sector, conductive textiles are used for clinical as well as non-clinical applications. These textiles are designed to provide comfort and functionality at the same time. The textiles can help healthcare providers monitor and communicate conditions of patients, as they can detect, acquire, and transmit physiological signals. Development of products that are small, thin, light, and reliable are some of the key factors considered by manufacturers of consumer electronics. Conductive textiles are used in products such as smart watches, augmented reality headsets, multimedia players with computing facilities, and smart goggles. Conductive textiles are used in the sports & fitness segment to monitor sleep, calories consumed, heart rate, blood pressure, and so on. Increased health awareness among population globally has led to a high demand for conductive textile from this sector. What are the upcoming industry applications for conductive textile? High cost of finished product can affect the adoption rate is a major factor restraining the growth of the market. Copper, carbon, nickel, silver, gold, and titanium are some of the most commonly used metals in the conductive textiles. Fibers are coated or embedded with these conductive metals to form conductive textiles. The high cost of these materials affects the pricing of conductive textiles. This leads to high-priced final products, which can affect the adoption of these products by end users, especially in developing economies. Thus, the high cost of final products can restrain the growth of the market in near future. Key players in the market include Parker Chomerics (U.S.), Toray Industries Inc. (Japan), Laird PLC (U.K.), and Bekaert (Belgium) among others. 11.6 Hitek Electronic Materials Ltd.
*Details on Business Overview, Products and Services Offered, and Recent Developments Might Not Be Captured in Case of Unlisted Companies. 11.16.10 Wujiang City Yuzhen Textile Co. Ltd.